To promote the launch of Ariana Grande’s new fragrance ‘Cloud’ guests were invited to 9-11 Shorts Gardens to step into the glowing world of Ariana. Once inside, guests could immerse themselves in interactive photo areas and share their content with the #ArianaGrandeCloudUK tag. The experience centred around a custom interactive vending machine, the Vendmax created by London based tech start-up Social Vend. 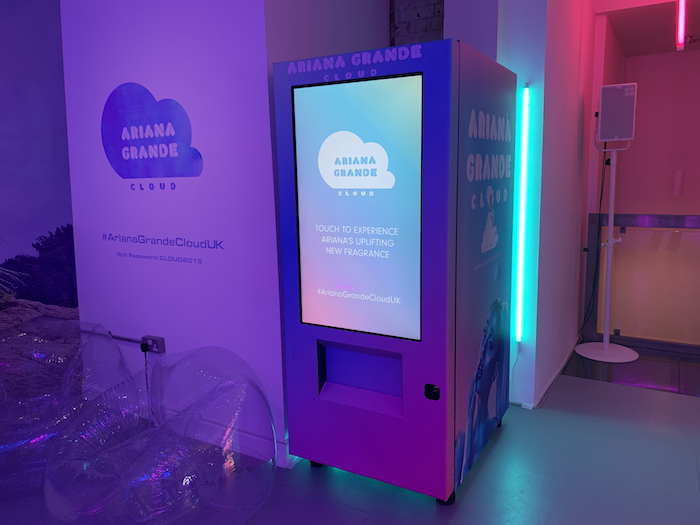 The vending machine was programmed to dispense Ariana goodies and samples of the new ‘Cloud’ fragrance to guests in exchange for posting photos to Twitter & Instagram with the event tag #ArianaGrandeCloudUK. The activations proved popular and saw over a thousand visitors over two live days.